PARADISE IS ONE PURCHASE AWAY: Are you looking to get away to a small quiet city where the weather is a close to Southern California weather as anywhere outside of Southern California where the summer days are warm with low humidity (80's and 90's) and the evenings are perfect with beautiful blue skies and the winters are moderate (50's and 60's) with more sun than Southern California? If so, then you must look at this commercial restaurant real estate for sale in this city where a military base makes the economy more stable than most other small city in the country. 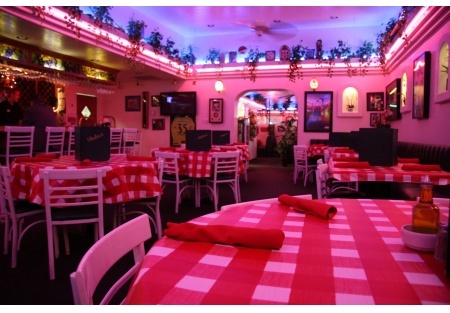 THE PROPERTY: This restaurant property is in great condition with the owner's pride showing throughout. It is clean and constantly being upgraded and updated. It is currently an Italian restaurant, but the business is not being sold as part of the sale as the price will attest to it. Of course, you continue to operate the business if you like, but you pay nothing for it! There is nearly 4,000 sq. ft. of restaurant space plus more than 500 Sq. Ft. of outside storage space. Where else can one buy a turn-key restaurant for about $125/Sq. Ft.? Nowhere! One can't bulld one for less than $200/Sq. Ft.! The building is a stand alone building on one of the major highways in the city. The building is a stand-out in the community! There is plenty of parking too. The inside of the building contains a bar area serving hard liquor as well as beer and wine. The bar seat perhaps 8+ people. In the bar area there is dining as well seating about 30 people. There is also a private banquet for parties and overflow. THE EQUIPMENT: This restaurant is turn-key, particularly if you're going to do Italian food where there are two first class rotary pizza ovens. If you're going to do other food, you may have to change out the pizza ovens, which won;t take much effort. FINANCING: And to make the purcahse of this commercial real state an even more attractive, there is a good chance a local bank will finance the deal with an experienced owner with a proven track record of success. But if bank financing can't be found, the owner would consider carrying 50% of the purcahse price for the right buyer with good credit and experience. STAFFING: What makes this purcahse even more attractive is that is comes full staff with an experienced team if you'd like to keep them. See the video by signing the confidential agreement. The demographics in the area are great too! You've got to see this commercial restaurant property to realize you're stealing it from the owner. It is a great location! WOW! Buy Building and Get Business For Free! Great Arizona High Desert Year Round Climate - Not Too Hot! Three Outside Buildings Used For Storage and Office Space, not Included in Sq. Ft.